Parents may be focused on cancer treatment and their child’s immediate health. Parents may feel uncomfortable discussing issues of reproduction with their children. Cancer and cancer treatment may affect your child’s fertility. Based on your child’s treatment plan, his/her risk of infertility is [high, moderate, low] (see table on reverse). 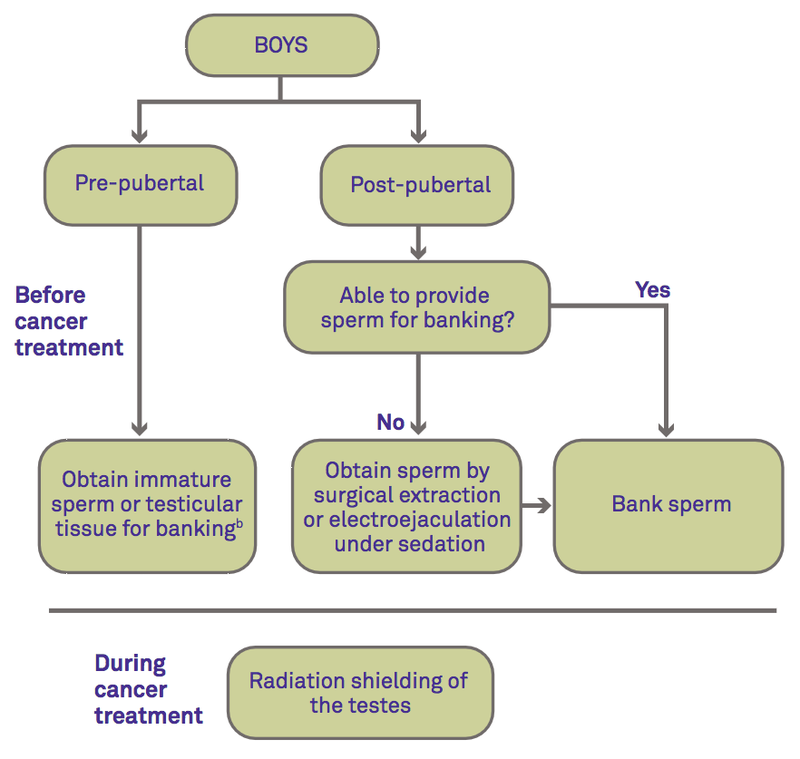 There are options to try to preserve your child’s fertility before he/she begins cancer treatment (see figure to right). I can refer you to a fertility preservation specialist if you would like to discuss your child’s options further. 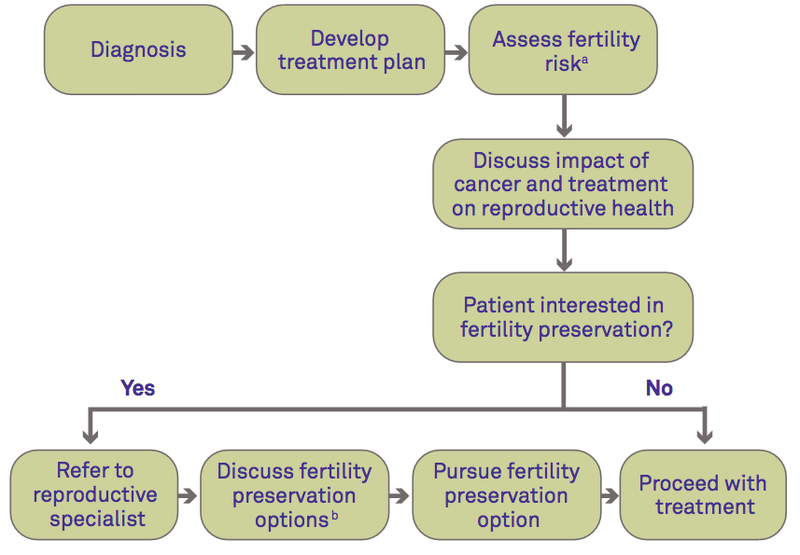 The following diagram gives a brief description of fertility preservation options available to children diagnosed with cancer before and after treatment. There are several resources listed on the reverse that can help you and your patients locate a fertility preservation specialist to discuss tissue banking. a Not an option if there is a high risk of ovarian metastases. b Experimental—only performed as part of a clinical study approved by an IRB. The following table classifies various cancer therapies and regimens based on their known infertility risk. 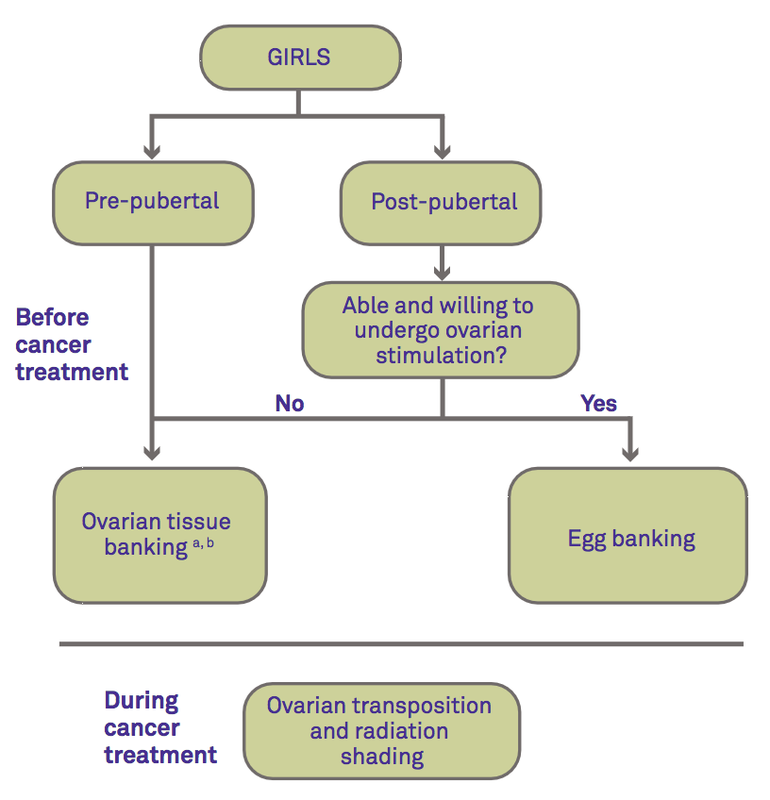 While this table provides general guidelines, each patient is different and treatment may impair their fertility differently. Table adapted from LIVESTRONG; Nieman CL, et al. Cancer Treat Res. 2007;138:201-217; and Chow EJ, et al. Lancet Oncol. 2016;17:567-76. Chow EJ, et al. Pregnancy after chemotherapy in male and female survivors of childhood cancer treated between 1970 and 1999: a report from the Childhood Cancer Survivor Study cohort. Lancet Oncol. 2016;17(5):567-76. Long CJ, Ginsberg JP, Kolon TF. Fertility Preservation in Children and Adolescents With Cancer. Urology. 2016;91:190-6. Nieman CL, et al. Fertility preservation and adolescent cancer patients: lessons from adult survivors of childhood cancer and their parents. Cancer Treat Res. 2007;138:201-217.